Journalist and retired Soviet military intelligence (GRU) Colonel Nikolai Poroskov provides the inside story of Swedish Air Force Colonel Stig Wennerström, who ferreted out NATO secrets for the GRU for nearly 15 years from 1948 to 1962. Poroskov relies on the first-hand testimony of Wennerström’s case officer and friend, GRU General Vitaly Nikolsky. On June 13th, 1952, a Soviet Mig-15 interceptor shot down a Swedish Douglas DC-3 on a reconnaissance mission over the neutral waters of the Baltic Sea. There were eight crew members on board. At that time the Swedes announced that the plane was carrying out a training flight. A half-century later, in 2003, 55 kilometers east of Gotland the Swedes uncovered the body of the airplane and raised it from a depth of 126 meters. The tail end of the vehicle was torn to pieces by machine gun fire. The bodies of four men were found; the fate of the other four has remained unknown. This time around the Swedish side admitted that the plane was monitoring Soviet military bases. They were sharing that information with the United States and Great Britain. It was then that NATO wanted to find out as much as possible about Soviet anti-air defenses in the area of the Latvian and Estonian coasts: in the case of war US and British bombers would pass precisely through this “Baltic corridor” with atomic bombs bound for Leningrad and Moscow. The downed plane was named Hugin after Odin’s raven that would inform him of all news across the world. In the cabin there was American and British equipment – the result of a secret agreement between neutral Sweden and NATO: hardware in exchange for the results of intelligence flights. In Moscow the objectives of the Swedish “transport plane” coursing near the edge of Soviet territorial waters were well known. Information came from a colonel in the Swedish Air Force, Stig Erik Constans Wennerström, who worked nearly 15 years for Soviet military intelligence – the famed Main Intelligence Directorate of the Armed Forces General Staff, or simply the GRU. The airplane was also shot down on his lead. Perhaps GRU Major General Vitaly Aleksandrovich Nikolsky, who was Wennerström ‘s handler in the two years before his arrest, knew him better than most. I met the retired General Nikolsky at the beginning of the 1990s. He came to the editorial offices of Red Star and shared recollections of war comrades in his partisan days. One day he invited me to his home and told me he was writing a book on the Swedish period of his life. GRU Major General Vitaly Nikolsky, Wennerström’s handler. In Stockholm Nikolsky worked “under the cover” of the Soviet military attaché. In his book of memoirs Aquarium-2 (as opposed to Viktor Suvorov’s The Aquarium), he was allowed to put in a small chapter on Stig Wennerström. Wennerström ‘s operational code name was Eagle, though Nikolsky called him Viking. On the day of establishing contact with the Soviet military attaché, Wennerström was the chief of the Air Force section of the Swedish Ministry of Defense’s Command Expedition. Stig was 54 then and looked strong, and he was always a good-humored and interesting storyteller. Aside from that, he was a master of snow and water skiing, a Swedish curling champion, a marksman, photographer, pilot, and driver. He was highly fluent in Finnish, German, and English, and proficient in French and Russian. Not counting, of course, his native Swedish and Danish. He knew how to hold himself in society. Wennerström was a distant relative of King Gustavus VI Adolphus and even served as his adjutant for a time. Stig had a wide sphere of acquaintances in military circles and practically unlimited access to documents of state importance. He mainly gave information on NATO: plans for the defense of Northern Europe, a description of the new English Bloodhound surface-to-air missile, the basics of British anti-air defenses, characteristics of new American Sidewinder, Hawk, and Falcon air-to-air missiles, and also data on major alliance maneuvers. 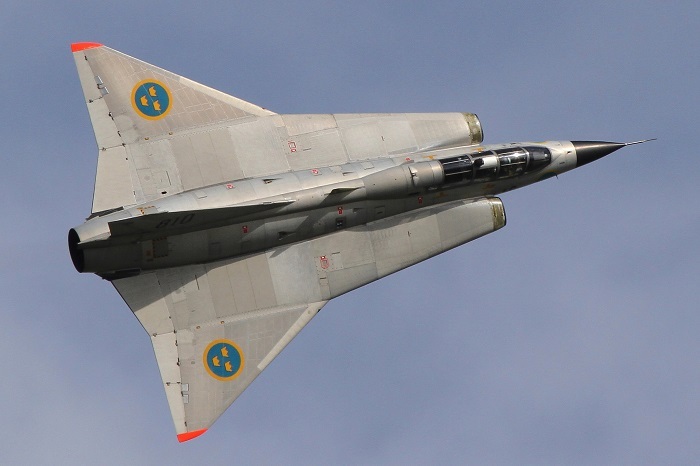 He also informed us of the development of the Swedish all-weather interceptor, the J-35 Draken, and the coordinates of an underground Swedish Air Force base being built in the coastal cliffs. Stig Wennerström completed the naval academy and flying school, and he served on the staff of the Swedish Air Force. In November of 1940 he received an appointment as the air attaché to Moscow. By that time Stig, by temperament inclined toward adventurism, was already passing secret information to German counterintelligence. In 1943 Wennerström would command a squadron, and in 1944-45 he was the Swedish Air Force officer responsible for liaison with representatives of foreign air forces. In 1946 through General Reinhard Gehlen, one of the former chiefs of German military intelligence on the Eastern Front and then the founder of the Gehlen Organization (predecessor to the BND), the United States received Abwehr documents in which Wennerström was positively portrayed. After that he was recruited by the Americans. In the same year, having been at a Soviet Air Force parade in Moscow, he wrote a report on the prospects of intelligence activity on the territory of the USSR. In a word, Viking was of an extremely multifaceted nature. As a result of our constant being together in cars, airplanes, or trains, there grew a certain likeness of friendly relations between us… Once he read out an article from a local newspaper on the modernization and strengthening of landing strips at some military airbase. He lit one of his invariable hand-rolled cigarettes, thought awhile, and then uttered, “I should confirm that in documentary form.” I laughed: “There’s an old saying: one hand washes the other.” He said, as before not looking at me, “We can pose the question another way. How much do you want for that miserable airstrip? Two thousand?” We finally agreed to five. Sometimes recruitments go that way. Wennerström was to keep the GRU up-to-date on the course of US strategic plans and military potential. He did that so well that Soviet military intelligence accorded him the rank of major general. It’s true that this version is denied by some officers. From April of 1952, Swedish military attaché in Washington Wennerström oversaw the purchase of armaments for his country’s Air Force and was well-informed of all that concerned American projects. Returning to Sweden in 1957, up to his retirement in 1961 he was a chief of sector under the operations department of the general staff. He was in close contact with NATO staffs in Denmark and Norway, since he taught strategy at Swedish Air Force officer school and was a major expert on disarmament issues. But let’s return to General Nikolsky. As he told me, he established personal contact with Wennerström in October of 1960, when the Soviet military attache paid a visit to the Command Expedition for the first time. 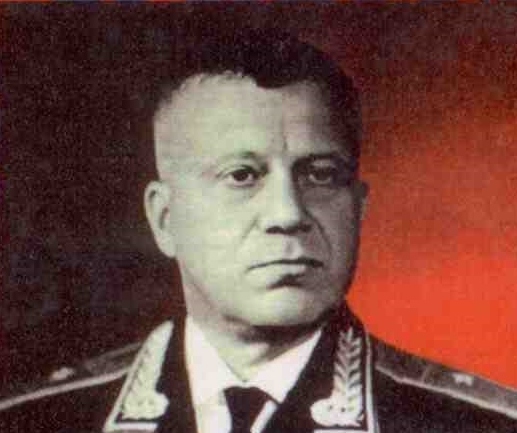 Nikolsky’s predecessor, who had worked with Stig, introduced the general as his future case officer. During the first meeting, Wennerström quite simply took out of his safe one-and-a-half dozen photo cassettes. On the films were technical descriptions of the US Hawk missile, which the Swedes had recently acquired. Nikolsky was even somewhat dismayed. He had to shove the film rolls into his pockets. For half a year – until the spring of 1963 – Viking passed his Soviet handler several thousand slides of special “Shield” film supplied him by the GRU, with operational documents on military, military-political, and military-economic matters. This film couldn’t be developed without special processing by chemicals known only to the GRU’s laboratory. It’s true that later this didn’t turn out quite that way: after Wennerström’s arrest, Swedish counterintelligence officers selected the chemical within a few days. However, no one could deny that the materials reached the GRU before then made it to the desks of high-ranking Swedish officials. The safes at the defense staff were open for Soviet military intelligence. 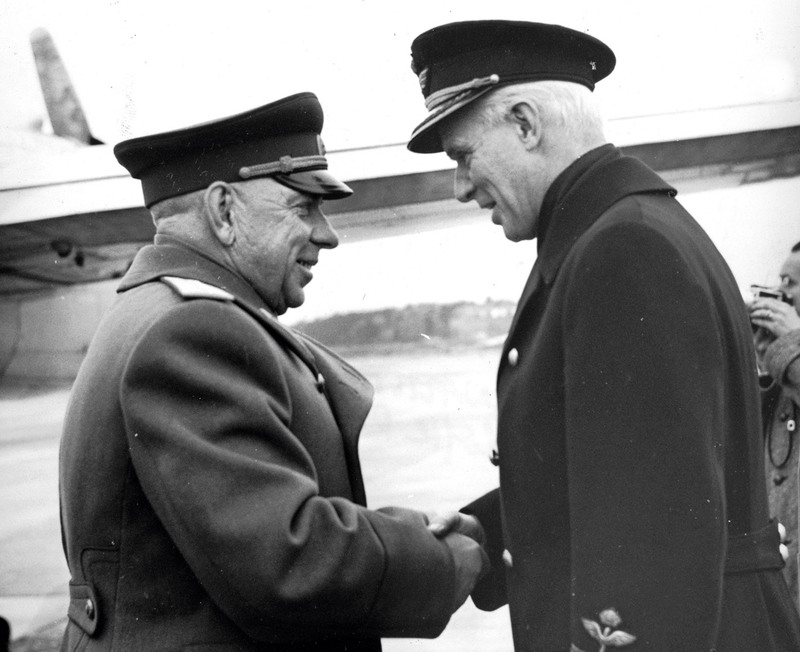 Swedish Air Force Colonel Stig Wennerström (R) with Soviet GRU General Vitaly Nikolsky (L). RIA Novosti. Especially valuable was Wennerström’s information on US and British missile weaponry intended for supply to the Swedes. In General Nikolsky’s words, all 47 regiments of the Swedish Army were studied up and down by the GRU residency. Their level of training was precisely known, as were their contacts with NATO staffs. During the Cuban Missile Crisis, Wennerström gave details of the US Navy’s shift to combat readiness and the entry of a formation of US submarines into the North Atlantic – possibly for blocking Soviet ships on the way to Havana. To pass this message, Stig called the Soviet embassy military attaché’s office directly and invited Nikolsky to a restaurant not far from the Command Expedition. It was risky, but a refusal would be even more suspicious for audio surveillance, and the general agreed. In the restaurant the Soviet handler didn’t hold back: “If we are going to observe tradecraft this way, then I’ll have to leave the country in 24 hours, and you’ll be in prison for life.” Stig then laughed and said that contacts of the Soviet military attaché with local residents were under his personal control. Indeed, the Command Expedition monitored contacts with foreign military attaches, fulfilling the functions of military intelligence and counterintelligence. The transfer of a cassette with film in one direction and monetary reward and orders from the Center in the other took place at many diplomatic receptions. Sometimes written instructions by the Center were passed through Soviet cigarettes. Vitaly Aleksandrovich was always afraid of mixing up the special packs with normal tobacco. Once, during a movie showing, Wennerström passed over ten cassettes in the presence of the chief of Swedish counterintelligence (How’s that for intelligence humor?!). In the practice of espionage, this is possibly a singular case. Problems with tradecraft continued. One day Wennerström, in his service car with a red light and siren, drove straight up to the house where his handler lived. He needed to immediately hand over the layout of the government’s command center and defense staff for a state of emergency, although transfer of these documents didn’t require any hurry. There was a case when Viking intercepted his handler on the way to work. Nikolsky even threatened to report Wennerström’s lack of discipline to the Center and refuse to work with him at all. That frightened Wennerström; he didn’t want to part ways with the GRU. Viking’s compensation was a quarterly 12,000 Swedish Kroner denominated in hundreds. Larger notes were closely controlled by fiscal agencies. In Nikolsky’s opinion, the sum was not large, taking into account the value of Viking’s information. A rather large bag with new cassettes and money were left by the handler, for example, in the medicine cabinet of his own apartment, where he invited Swedish officers. The keys were in the hands of only two initiates. The same type of medicine cabinet was also at Wennerström’s villa. 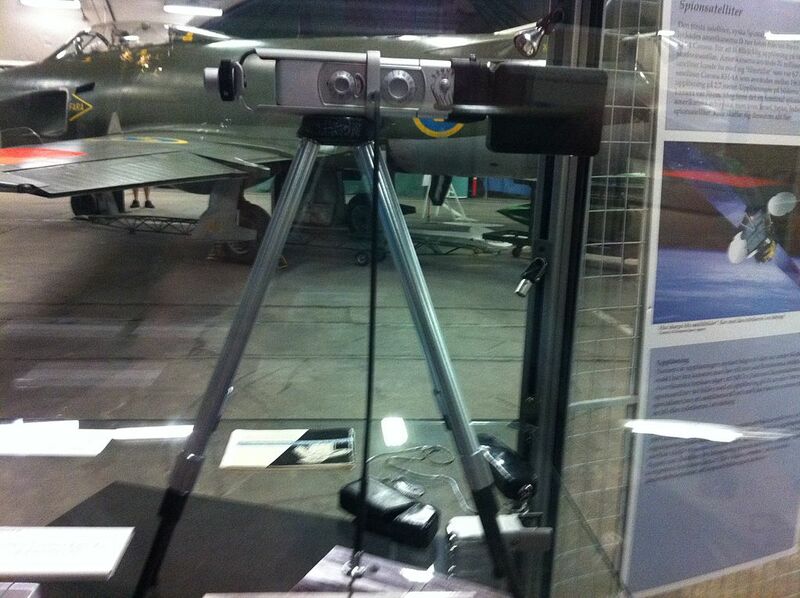 Stig Wennerström’s Minox B camera with document stand, located in the Swedish Air Force Museum. In the spring of 1961, Stig was knocking on 55 years, the age limit for a colonel. He didn’t have any prospects of becoming a general, and he was set to retire. According to the law, even the king couldn’t leave him in the army. He was losing access to valuable documents. Afraid that the GRU would reject his services, Viking launched energetic activity, having forgotten completely about tradecraft. With Stig’s retirement, there was no more official excuse for meetings with his handler. Nikolsky assigned him the selection of three dead drops in a city park for the exchange of microdot messages. Signals for loading and unloading the “cargo” were agreed to be placed at spots on the way from the Soviet military attaché’s house at No. 2 Linneigatan to the Soviet embassy at No. 12 Villigata. Every intelligence officer, especially a major one like Stig Wennerström who worked for Soviet military intelligence for almost one-and-a-half decades, has a number of blank spots and untold stories in his biography. And many versions, guesses, speculations, and fantasies, including in relation to how he was blown. Yes, Maj. Gen. Nikolsky admitted, Stig clearly flouted tradecraft. The likely reason was his character, adventurous by nature. Wennerström’s position in the country’s military hierarchy was likely another reason for his recklessness. Stig, we will remind you, served in the Command Expedition’s department carrying out contacts with foreign military attaches and fulfilling the functions of military intelligence and counterintelligence. But there were also other reasons that today could be seen as hypothetical because of a lack of weighty foundations and proven facts. A month before his retirement, personnel officers offered Reserve Col. Wennerström two positions within five minutes: the military advisor for the Swedish foreign ministry or the general consul in Madrid. Viking asked Nikolsky for advice. The general sent a message to the Center with a proposal to agree to Madrid. The Center, on the other hand, chose the first offer. This likely accelerated the agent’s exposure. One of the multitude of versions of the colonel’s exposure and compromise posits that everything originated with British counterintelligence, MI5. Its officers had turned their attention to the fact that the Russians were often better informed of what kinds of armaments Britain was supplying the Swedes than the Swedes themselves. Surveillance of Wennerström was conducted from the summer of 1962. They managed to establish that the reserve colonel had an account in a bank in Geneva, where he was then working as a Swedish foreign ministry expert on disarmament issues. The monitoring of Wennerström’s telephones was organized. On June 19th, 1963, housekeeper Karin Rosen, recruited by Swedish counterintelligence, uncovered a cache of microfilms in Wennerstrom’s attic. On the morning of June 20th, Wennerström, a knight of Sweden’s Legion of Honor and a distant relative of Gustav VI Adolphus, was arrested on the way to work. Wennerström’s biographers also name other possible versions of treachery: an unconquerable passion for gambling in casinos and the Swede’s pacifist and even pro-communist views. According to the information of Western journalists, Moscow was blackmailing Wennerström, having in its possession facts of his espionage work for the Nazis during World War II. Emblem for Säpo, Swedish counterintelligence. Still another version: On June 20th, 1960, Säpo, Swedish counterintelligence, received from CIA agent and GRU officer Dmitry Polyakov, who worked for the Americans for a quarter-century, information on the existence of a GRU agent code-named Eagle in Swedish military intelligence. After that the trap was set for Eagle, and there began the thorough study and analysis of Stig Wennerström’s personal expenditures. More convincing than others is General Vitaly Nikolsky’s version. In the spring of 1962, the Center decided to set up a meeting with Wennerström in Helsinki. One of the deputy chiefs of the GRU (Nikolsky doesn’t name him, but according to some information it was Lt. Gen. Pyotr Melkishev) was sent to the Finnish capital for the briefing. In general the agent could have been briefed in Stockholm, as well, but it’s possible that the ranking officer needed an excuse for a trip abroad. In Helsinki the high-level guest, for reasons unknown, involved an officer from “the neighbors,” i.e. the KGB First Chief Directorate. Along with that Melkishev used the apartment of deputy KGB resident in Helsinki Anatoly Golitsyn, who was listed as an economist in the trade representation for cover. In December of 1961, Golitsyn defected to the United States and requested political asylum. It was there he also told British intelligence about a man who had arrived in Helsinki from Sweden for a meeting with a GRU general. Vitaly Nikolsky conceded that Wennerström was living large and often traveled abroad. He inhabited a luxurious villa in a suburb of Stockholm, retaining several servants. His expenditures clearly exceeded a colonel’s salary of 4,000 Kroner a month. It’s noteworthy that he also received as much from the GRU. One time the Soviet military attaché said as much to his friend and agent – to be a bit more careful about expenditures in the interests of security. Stig began to reassure him; after all, his wife was a well-off woman who worked in a bank, the villa was her dowry, and two cars per family was the norm for Sweden. As it later turned out, Stig was presenting wishes as reality to calm his overly vigilant Soviet friend. 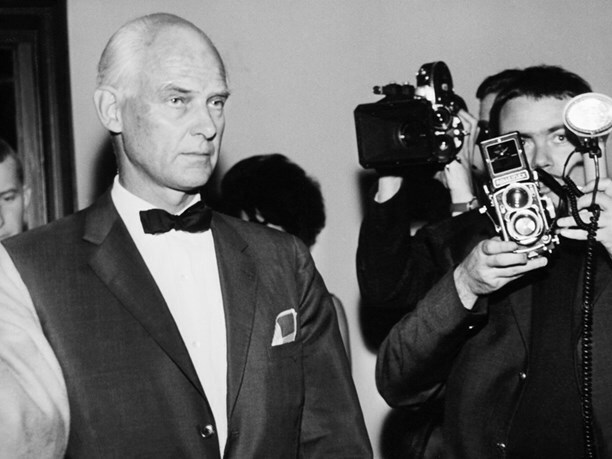 Wennerström’s extravagance, along with his negligence, confidence in the stability of his position, and certain other circumstances were the reason why he attracted the attention of counterintelligence at the beginning of the 1960s. The most central reason for Viking’s downfall, again following the version of Vitaly Nikolsky, was that the “traitor of the century,” GRU Colonel and MI6 and CIA agent Oleg Penkovsky, had found out about Wennerström. The GRU passed all information on new Western armaments, as obtained from foreign sources, to the Soviet military-industrial complex – in filtered form, of course. But documents coming from Wennerström went to the Committee on Science and Technology, where from 1960 Penkovsky had begun working. He didn’t have a direct relation to the Scandinavian line, but for a long time he did utilize documents that Viking-Eagle had purveyed. The traitor told of this during his meetings in London with the representatives of MI6 and CIA who were working with him. From there the lead was passed to Swedish counterintelligence, and the rest was a technical matter. In July of 1962, the Center ordered Nikolsky to hand Viking over to another residency officer who worked undercover as the embassy’s first secretary. The Center’s logic was simple: since the agent went to work in the foreign ministry, let a diplomat meet with him at receptions. They didn’t account, however, for one thing: such minor officials, as Wennerström had then become, practically weren’t invited to diplomatic receptions, and communications with Stig had essentially suffered interruption. Nikolsky thought that Wennerström was the most valuable agent Russian military intelligence ever had after Colonel Alfred Redl, who had provided Austro-Hungarian mobilization plans before the First World War. In Sweden he’s known as their most famous Cold War spy. Wennerström, however, didn’t make it into the book 100 Greatest Spies. After Stig Wennerström’s arrest, Nikolsky as the Soviet military attache, and also the embassy first secretary involved in the affair, were forced to leave Sweden. Fearing provocations, the GRU sent Nikolsky home not by a normal flight, but on the cargo ship Repnino, the loading of which was cut short. The general, the lone passenger, was brought through the Baltic on an almost empty ship with a displacement of 5,000 tons and a crew of more than 40 men. In the Motherland responsibility for what happened was laid upon Nikolsky. A scapegoat had been found. Nikolsky only found himself guilty of not insisting on impersonal contact with the agent through dead drops. He thought that the officer to whom he had passed Viking for handling might have attracted Swedish counterintelligence’s attention. Nikolsky doesn’t name him, but knowledgeable people in the GRU point to a G. Baranovsky. Despite his humble rank, immediately upon his arrival in Stockholm he acquired an expensive Mercedes 220. And this was at a time when even advisors drove in embassy duty vehicles. Moreover, this young man rented and luxuriously furnished a nice apartment, the sort his colleagues didn’t have. He stood out with knowledge of several foreign languages and was active beyond his rank with the locals. Swedish authorities promised they would give the press an announcement about the expulsion of two Soviet diplomats only in the morning. Yet it was hardly dawn when journalists of all leading and local media had put Nikolsky’s apartment under siege. The woman concierge deceived the reporters, saying that the Russian general had already left for the port, and so everyone rushed in that direction. Nikolsky was accompanied just by his deputy, to whom he handed over secret documents and currency before departure. By a hurried escape on a cargo ship, without any dignified farewell, the Soviet side indirectly admitted the correctness of the Swedish government’s charges. As Nikolsky told me, the Center blamed him for the residency conducting “weak educational work” with the agent, which led to his loss of vigilance. As they would say today, hindsight is 20/20. Someone in the leadership accused Wennerström of suffering a pathological greed, which made him neglect caution. The court sentenced Viking to life in prison. In his last word he denied the charge of harming Sweden’s security – he couldn’t be judged for revealing NATO plans. Wennerström also said that he had been working for the prevention of a new world war. And truly, the Cuban Missile Crisis didn’t escalate into nuclear conflict partly due to his information. For Vitaly Nikolsky, Viking’s compromise meant the end of his intelligence career. He was removed from operational work. For two months, while an investigation was ongoing, he was at the disposal of the chief of the GRU. In November of 1963, he was appointed the head of a faculty at the Military-Diplomatic Academy. Five years later he retired. The Saab J-35 Draken, the technical secrets and capabilities of which Wennerström forwarded to the GRU. Wennerström, meanwhile, was sitting in prison. He demonstrated model behavior there and worked in a center for juvenile prisoners as a teacher of foreign languages, including Russian. Consequently, in 1974 at age 68, he was amnestied and freed for exemplary behavior, returning home to his wife in the city of Dursholm. One must give Soviet intelligence its due – several times they attempted an exchange for Wennerström, but for some reason it didn’t work out. Court inquiry materials with Wennerström’s detailed confessions and information from the investigation were declared a state secret for 50 years. In 1959 Nikita Khruschchev had cancelled his visit to Sweden under the pretense of an anti-Soviet campaign that had been unfurled in the Swedish press, but in 1964 he nonetheless travelled to Sweden despite the scandal of Soviet spy Stig Wennerström’s unmasking. Wennerström lived his last years in a Stockholm home for the elderly and died just short of 100 years. Vitaly Aleksandrovich Nikolsky, having dedicated over 40 years to military intelligence, until his final day didn’t know whether his friend and protégé was still alive. Work Translated: Поросков, Николай. “Успехи и провал Викинга.” Независимое военное обозрение, 05.06.2015.